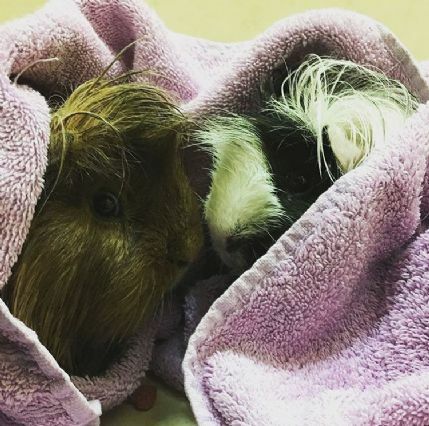 We are a friendly mid-30's couple with guinea pigs of our own, and love all little animals! We are caring and attentive animal people and would love to give your little pet a short holiday of their own! We will give you complete peace of mind when leaving your furry friends with us, so that you can enjoy your holiday knowing that your pets will be well cared for, handled regularly and given lots of attention. We mostly use plastic cages with added attachable pen areas, over two dedicated rooms so there is plenty of floor space for your pet to run around on. Your pet will always stay indoors, and for maximum safety will out of contact of any of our other guests. Myxomatosis & RHD vaccinations are required for rabbits. You will need to bring proof of your vaccination with you. Prices range from £5 - £8 per day for most of the year. Discounts are available for 14+ days holidays. *Prices may increase at Easter, Summer and Christmas due to high seasonal demand. We will provide you with photo updates for extra comfort whilst you are away. We didn't have anyone to look after our Hamster for over a week so it was great to find the Small Pet Hotel. They were flexible in dropping off and collecting and it was appreciated that we received some photo updates while we were away so the children could see what their Hamster was up to. Very friendly service. We left Dorothy (our little black/white rabbit) at the small pet hotel for a week. We couldn't have been happier with our decision. She was well taken care of, fed and loved. We were also sent photos which put our minds at ease. Huge recommendation for anyone with a small pet who wants a nice home for while you are away.